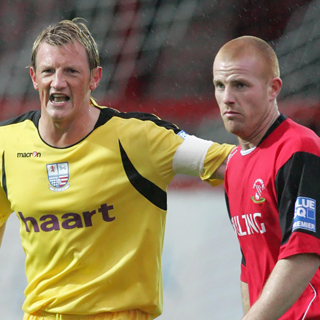 Wayne started his career with local side Swindon Supermarine, before moving on the Witney Town and Forest Green Rovers in 1999. He remained at Forest Green for two season and in 2001, achieved notoriety by scoring a classic own goal in an FA Cup tie against Morecambe. Despite this, his form came to the attention of a number of League sides, and he moved to Oxford United for £35,000 in December 2000. He made over 50 appearances before moving to Chester City in the summer of 2002. 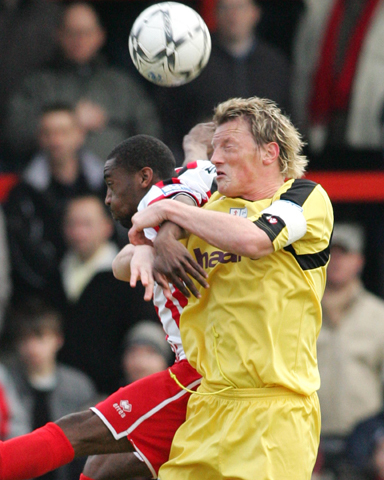 Kidderminster then paid £8,000 for the solid central defender in October 2003, and he established himself as club captain, and earning a three year contract at Aggborough. Wayne joined Diamonds on 18 January 2006 during the transfer window for a fee reported to be £8,000. Manager Barry Hunter was looking to strengthen the defence and bring in some experience in an effort to keep Diamonds in the Football League. The defender scored his first goal at Bury the following month demonstrating his fierce free kick with a goal from 35 yards out. During the 2007/2008 season, the 32-year old defender made 22 League appearances; scoring three goals for Diamonds, with his final goal for the club in the 1-0 home win over Northwich Victoria on 29 December 2007. On 17 January 2008, he left the club to join Cambridge United in a five figure fee, reported to be £20,000. After a successful period at Cambridge United, he agreed a two-year deal to become player / coach at League of Ireland Premier Division side Dundalk, joining the club on 5 January 2010. He was soon offered the post of assistant manager to Ian Foster. After just one year however, he was released by mutual agreement at the end of December to join up with Dean Holdsworth at Conference side Newport County, taking up a player / coaching role from January 2011. Wayne left at the end of the 2011/2012 season, before agreeing a deal with newly promoted Conference North side Brackley Town on 10 August 2012. On 4 November 2012, Wayne announced his retirement from the game, but less than two months later, was appointed manager at Northern Premier League Division One South side Stamford on 3 January 2013. After just four months, he guided the club to promotion following a Play-Off Final win over Chasetown, but this was to be his final game in charge of the Daniels. On 23 May 2013, he took up the post of First Team Coach at newly promoted League Two side Newport County, teaming up with former Diamonds boss Justin Edinburgh. He left there in 2015 after Justin Edinburgh moved to Gillingham joining up again at Gillingham for 18 months before returning to Newport County as Assistant Manager in March 2017.